The future is bright for pumped hydro in Australia, and for storage in general. However, no energy solution can exist outside of the real and competitive pressures of the market. Technical viability and environmental benefits won’t be enough to get projects over the line if they can’t demonstrate their financial soundness. The traditional revenue source for pumped hydro is arbitrage – in other words, making the most of generating when the spot price is high, and pumping when the spot price is low. But this relies on a certain level of predictable variability in the electricity market, and for that variability to continue into the future. Financing an energy project requires a firm revenue forecast. Lenders may consider ‘firm’ to be a 90% confidence limit, which means the developer must demonstrate that the project can generate a certain amount of revenue 90% of the time, or, say, in 9 out of 10 years. This means that a robust and reliable forecast of project utilisation must be made. Forecasting revenue for an asset with a lifecycle of up to 100 years requires detailed modelling of a wide range of factors influencing the electricity market, including supply (factoring in new entrants, storage, retirements and developments in the thermal sector, etc. ), demand (including changes in industrial load, impacts of electric vehicles, etc. ), fuel prices, government policies, and bidding strategies for large-scale wind and solar projects. For a storage project, the influence is likely to be both an increase in low prices and a decrease in high prices. If the market is robust enough and the proposed project is relatively small, the influence could be minor. However, a very large project is likely to influence the market to such an extent that the utilisation of the project may significantly reduce, which would reduce project returns. High price events in the electricity market will certainly continue to occur, but it’s impossible to predict their timing. Energy storage projects can provide insurance to exposed customers (such as retailers and major industrial customers) through a cap contract in a similar way to gas turbines and other peaking plant. In practice, this may mean that the storage project rarely operates unless the price regularly exceeds the cap. Storage projects have the ability to provide network support services such as frequency control, inertia and fault level control. These services have increasing value in a grid with significant amounts of non-synchronous generation. At this stage, the markets for these network support services are very shallow and competition is increasing. However, the need for such services is likely to increase to the point where more significant markets are required. Government energy policy continues to be fluid, yet under the proposed National Energy Guarantee it is possible that there will be value in providing firming services – in other words, pairing ‘dispatchable’ generators (such as storage projects or open-cycle gas turbines) with ‘intermittent’ renewable sources of energy to improve reliability. Storage projects are exposed to market prices during both modes of operation (pumping/charging and generating). If, however, there was an option to pump/charge for ‘free’, wouldn’t that reduce the risk? Genex Power’s world-first Kidston ‘K2 Project’ will pair a 250 MW pumped hydro project with a 270 MW solar PV farm. 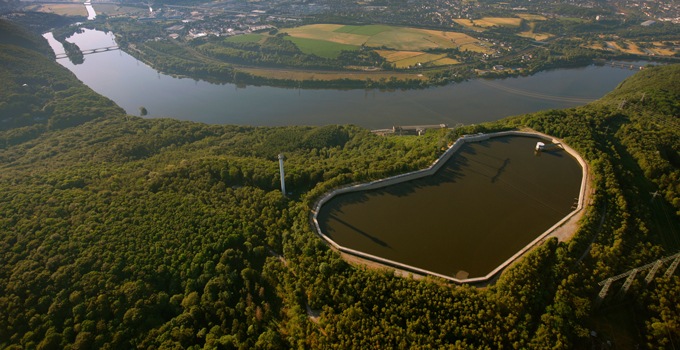 During the day, solar energy can be used to power the pumps in the pumped storage project. The pumped hydro project will then generate into the evening (and morning) peak. If the upper storage is ‘charged’ during the day, the K2 solar project can generate into the Queensland market and realise the benefits of large-scale generation certificates (LGCs). Of course, this arrangement relies on sufficiently high prices during peaks to recover the additional cost of the solar farm, transmission losses and any LGC liability. If you would like to discuss how Entura* can help you with your pumped hydro project, please contact Nick West on +61 408 952 315 or Donald Vaughan on +61 3 6245 4279. *Entura provides technical advisory services to prospective investors and developers. Financial advisory is not part of our suite of services, however, we partner with financial advisory firms supporting our clients. Entura is the consulting arm of Hydro Tasmania. Hydro Tasmania is licensed (AFSL 279796) to provide general financial product advice. Hydro Tasmania is not licensed to provide nor will it provide advice which considers a person’s objectives, financial situation and needs and you must therefore rely on your own assessment or seek your own independent advice in respect of decisions in relation to any financial product offered. Nick West is a civil engineer at Entura with more than 16 years of experience, primarily in hydraulics and hydropower. Nick’s skills range from the technical analysis of the layout of hydropower projects to the preparation of contractual project documents and computational hydraulic modelling. Nick was a key team member of the Kidston Pumped Storage Project Technical Feasibility Study.